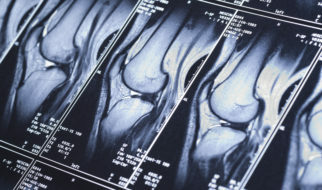 An MRI scan uses a magnet, radio waves, and a computer to produce detailed images of bones, joints, and soft tissues such as cartilage, muscles, and tendons to detect injuries. This scan can also find structural issues or other conditions such as tumors, diseases, and degeneration. There is no radiation used in this scan. This test is non-invasive and is usually an outpatient procedure. In some cases, an IV may be given to deliver a contrast dye into your veins. An MRI scan is sometimes better than CT at distinguishing normal tissue from abnormal tissue. Your doctor may order an MRI scan of your bones and/or joints if there are suspected tumors, injuries, diseases, or degeneration. MRI can also be used to monitor results of surgeries, joint deterioration, or other reasons to be determined by your doctor. Boone Hospital has the only open high-strength MRI in Mid-Missouri for claustrophobia. We also offer IV conscious sedation or general anesthesia if needed. You will receive specific instructions from your doctor. Notify your referring doctor if you are claustrophobic, because sedation or anesthesia needs to be arranged in advance. Notify the MRI technician about any devices or metal objects inside your body. Also, tell the technician if you have: permanent eyeliner, tattoos, prior bullet wounds, IUD, if you work with metal for a living, or if you are wearing a medicine patch. Notify the technician of any allergies, and if you are pregnant or nursing. If you will be receiving a sedative, arrange for a ride home after the scan. You will be asked to remove clothing and other objects. You will be given a gown to wear during the scan. If a contrast dye is needed, you will receive the IV at this point. A headset will be provided to block noise from the scanner. You will lie down on a table that slides you into the long cylindrical scanner. You will be able to see and talk to the technician during the procedure. The MRI technician will talk to you and give you instructions throughout the scan. After the scan, you may be monitored for a period of time to make sure there aren’t any after effects from the contrast dye and to allow the sedative to wear off.